This is the first of three volumes exploring some of the most remarkable insights into Ancient Egypt to have come to light in modern times. 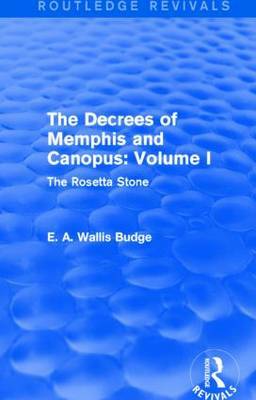 The first two volumes deal with the Rosetta Stone, an outstanding archaeological discovery that has supplied the basis for Egyptian decipherment; the final volume explores the "Stele of Canopus", discovered in 1866. The significance of the Rosetta Stone lies in the three different languages that are inscribed onto it: Koine Greek, Demotic Egyptian, and, crucially, Hieroglyphic. This has facilitated a vast increase in our understanding of the sacred language of Ancient Egypt, as well as enhancing our understanding of the nature of kingship at a time of immense cultural transformation. First published in 1904, this reissue provides an accessible general introduction to this fascinating subject, useful for the amateur enthusiast as well as undergraduate students.